In the late 1960s and 1970s the development of the branch banking system nationwide provided architects with the opportunity to create a magnum opus on the manageable scale. Offering drive-in banking facilities, the branches related to the road visually, physically or inadvertently. This iconic and award-winning branch bank of the Trust Company of Georgia (now SunTrust) was designed by Atlanta architect Henri Jova, who came up with a form that had neither front nor back and could be read and recognized from a speeding vehicle on a busy freeway. It was published in Time Magazine, Interiors, and other publication when it opened in 1965. It remained as a bank until 2000. The Atlanta Preservation Center has been advocating for over a decade to preserve the building. Celebrated during the APC's "Ancients and Moderns" lecture series in 2003, it was placed on the APC's Endangered List. It was saved in 2005 when it was converted into the Pie Bar restaurant; since that time, it has been a series of bars and restaurants. The APC has been working to have the site declared eligible for National Register status. Currently, it is unoccupied and therefore remains in jeopardy. The APC has been working to have the site declared eligible for National Register status. 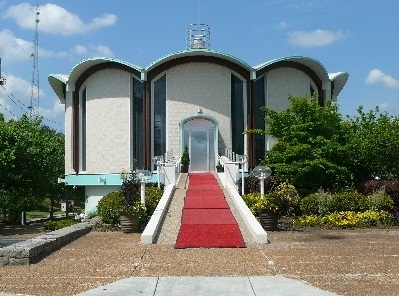 The building is significant as being representative of early modern architecture in Atlanta, as well as for its unique round design. Jova was a prominent Atlanta architect who also designed Colony Square, the Carter Center, and the Carter Library. It was listed in the Georgia Register of Historic Places and nominated to the National Register in August by the Georgia National Register Review Board. The nomination was sponsored by the building’s owner. As a National Register-listed property that is architecturally intact with minimal alterations, an adaptive-use rehabilitation of the building would have potential to be eligible for state and federal tax incentives. The building has been proposed for historic designation by the City.